Lately our weekends have been extremely busy. In addition to family commitments, visits, and (very sadly) a funeral, we have been packing in the miles. Not only that we have really been trying to add in fun activities for Claire. Just this weekend we were able to go to a pumpkin patch near our house with my brother, sister-in-law, and my niece. We picked pumpkins, held baby kittens, fed animals, and ate delicious butternut squash mac and cheese for lunch! Sound yummy? You can find the recipe here. Did you see our adorable Olaf from our Boo at the Zoo Saturday night? So needless to say, it's all about easy layers on the weekends. I have been living in my joga jeans and breaking out my vests. They are perfect for whatever mother nature decides to throw at us and for running/driving around everywhere! Today Osy from Style Diary by Osy is co-hosting. I swear that girl can rock anything! Love her street chic style to her boho style! She has a fabulous link up on Fridays called LinkPartywithOsy so make sure you head over there Friday if you aren't already linking up! Love your casual layers, perfect for a busy weekend! This is a perfect casual Fall outfit...love everything about it! I wear my olive vest all of the time, but I really love the color of this one. what a perfect Fall look, love it! Perfect combination- plaid, utility vest and booties! Love this look on you. Perfect fall layers for the weekend! Love this! Your outfit is pretty much what I live in, in the fall time. Booties, vests, and scarves. Great look here and that scarf is just perfection! 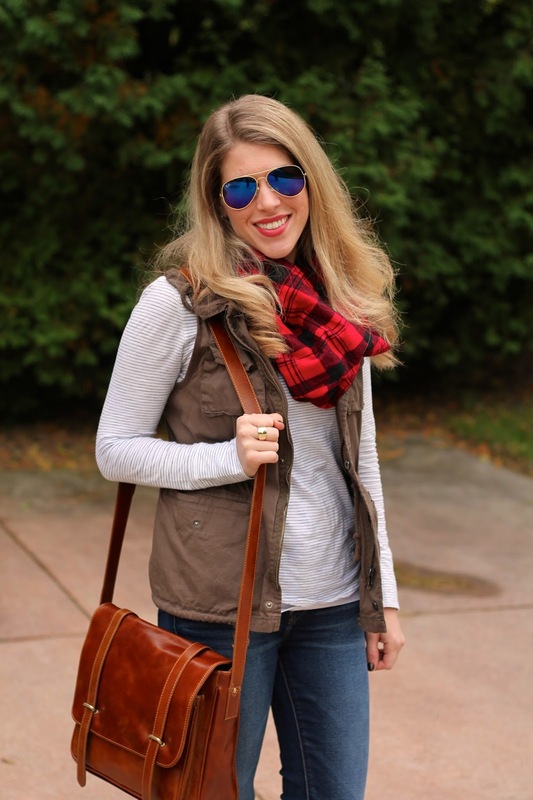 This is the perfect fall outfit- stripes + plaid scarf + utility vest! 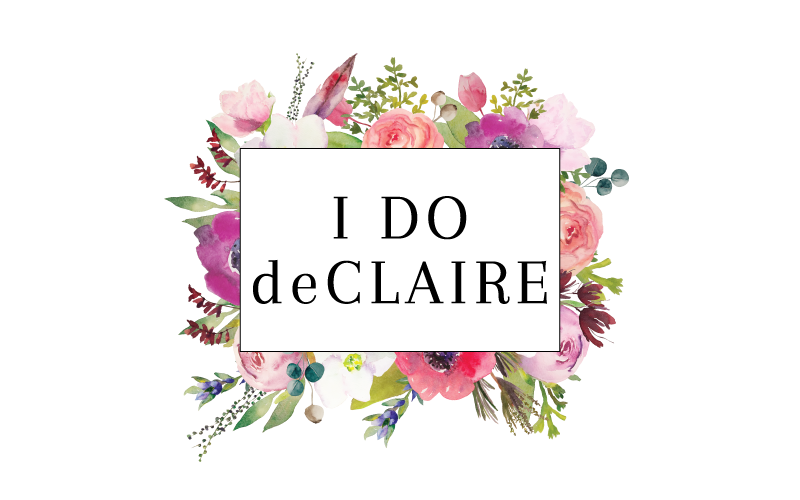 Thank you for this link up Claire! I'm meeting so many awesome bloggers via these link ups. 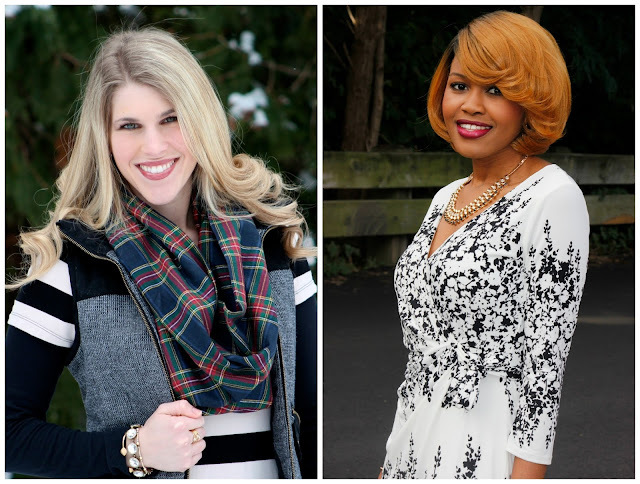 I want to invite you to the one I started on Sundays--Style Story Link Up. Laura, you look totally adorable and ready to be on the go! I'd wear this outfit head to toe. It would be a cute causal teaching look. Now if we could just get some fall weather here in San Jose. 80s all this week! I cannot take my eyes off that gorgeous cognac leather bag. And I remember this plaid scarf you DIY-ed because I made one per your instructions and mine is a cute red plaid, also. And sorry about the loss. Funerals are tough. Love your outfit! Totally my style! The scarf and bag are great accessories! 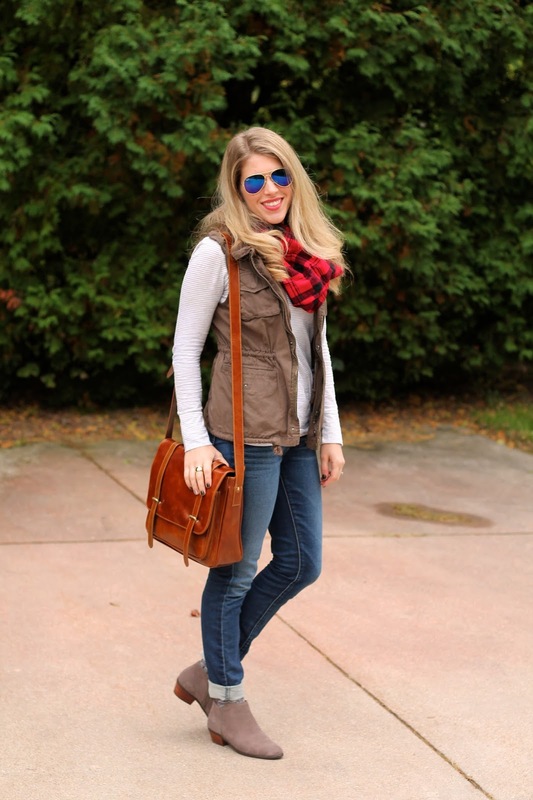 Such a classic and super cute fall look! Glad you found some time to enjoy family during all the business. I love this outfit. Perfect for the pumpkin patch. In love with this outfit Laura, you are rocking that bag well. What a classic and perfect Fall look Laura! I adore this casual look - so chic! I love this look, probably because this would be my daily uniform if it ever got cold in CA :) Love the booties! Laura, I'm in LOVE with this bag! It's such a classic look and I bet it goes with so many outfits! Sometimes it feels like the weekends are busier than the week days and time just flying right by! Glad you've at least mostly been having fun. So cozy + cute and soooo perfect for fall, lady! 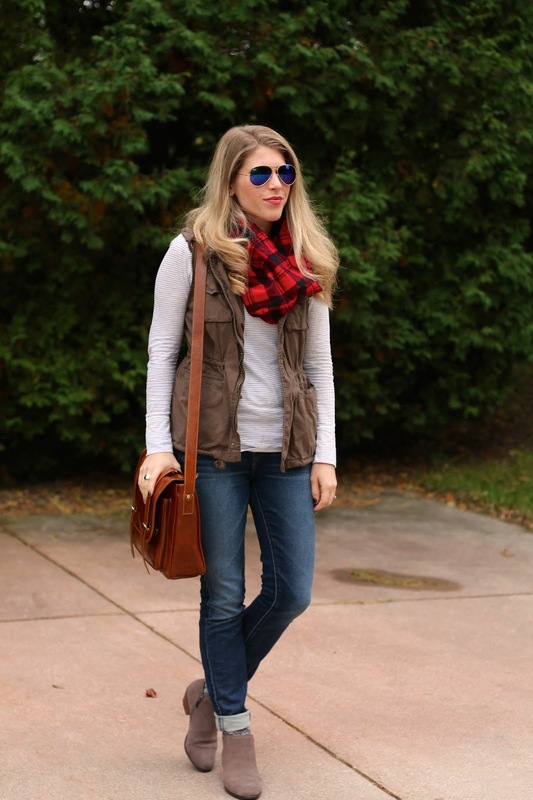 I love the plaid and military vest! 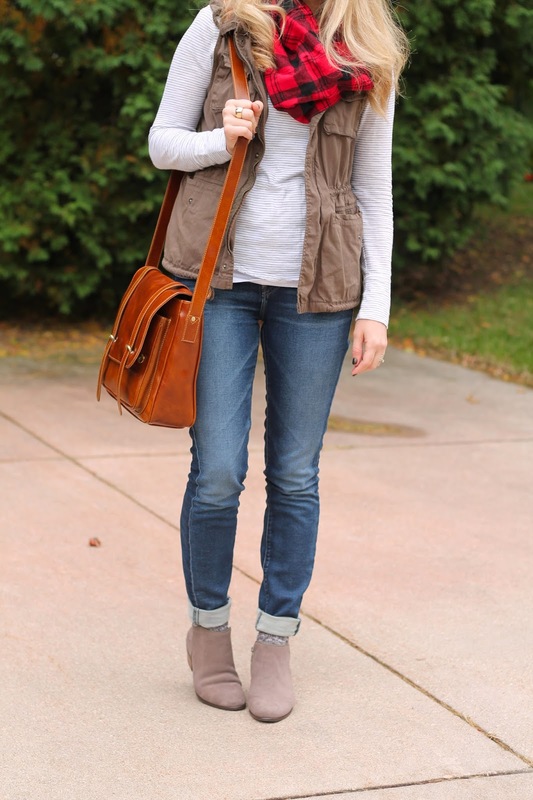 This is such a perfect Fall outfit! 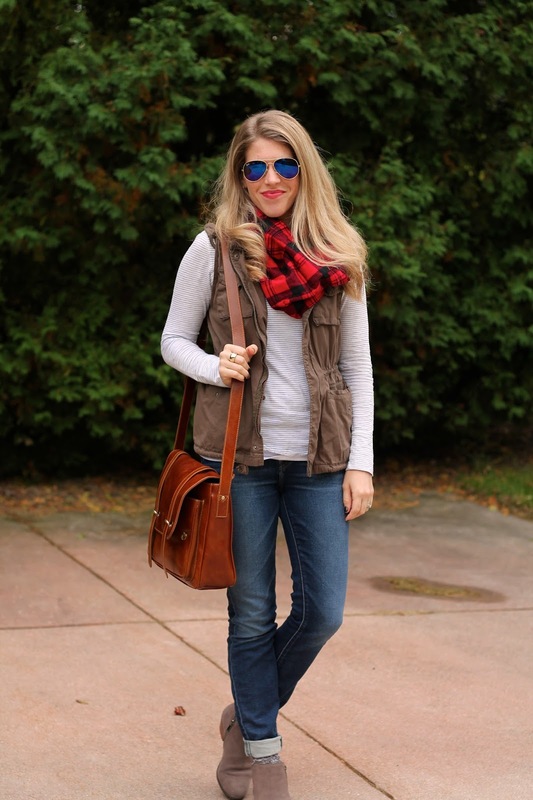 Adorable fall look, I'm loving your plaid scarf. Thank you for hosting! Love this layered look, perfect for a busy weekend. Really love that bag! Love this outfit. You look great and that vest is the cutest! Love the rich colour of the satchel bag which is a lovely contrast to the other pop of colour of your scarf giving the whole look a great balance against the softer colours of the outfit. Lovely ankle boots. Sorry to hear you had a funeral. Love your outfit! Perfect for fall!! You look so cute!! Adorable look! I love wearing vests. They keep me warm without the bulkiness of a jacket. 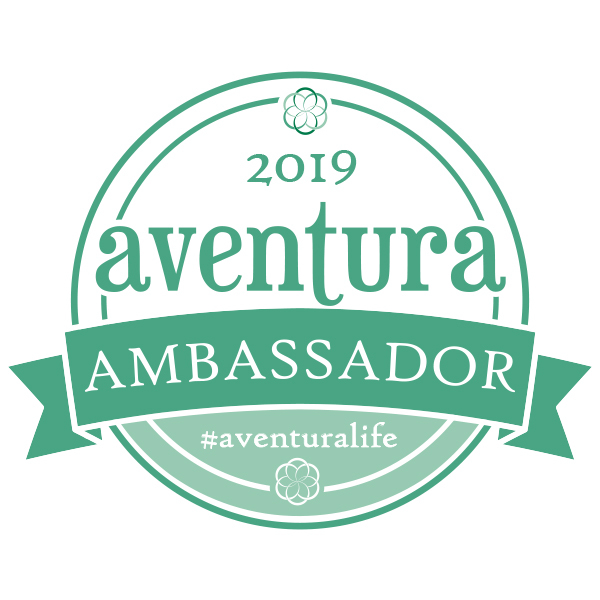 Thanks for hosting the link up and joining ours. Easy layers are definitely the way to go, especially when you guys are so busy! I'm sorry to hear about the funeral. The pumpkin patch sounds like fun! Baby kittens?? So jealous there! 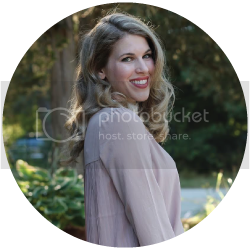 Fabulous fall look, Laura! I love plaid scarves. Yours looks perfect with your striped top and brown cargo vest. Love it! What a beautiful contrast of colors, counting your blonde hair too! Love your booties! Also those jeans look comfy! Petting kittens sounds so fun, I hope you get to relax a little more this upcoming weekend! What a great look- and that scarf is fantastic! I've been hunting for one and bet a DIY would be cheaper-- was it hard to make? And so sorry for your loss- sending hugs your way! Love your outfit! I'm not a big vest person, but I love seeing them on other people! i am in love with this outfit and i'm getting those booties, or similar as you linked, right now. neeed. Love your saddle bag, great cognac color! I wish I were able to rock a blanket scarf right now but the weather here doesn't call for it just yet :) Hope you're having a great week!